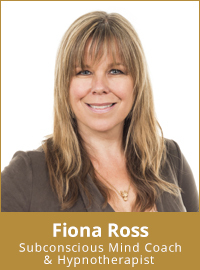 Fiona Ross is an accomplished complementary health professional with a wonderful set of Subconscious Mind Coaching approaches to draw upon. Fiona is an NLP Master practitioner and a qualified hypnotherapist. Fiona works alongside successful men and women who feel stuck, out of control or unable to function in situations they feel they should be able to handle. Her clients are people just like you, they are people who are struggling to overcome thoughts and behaviours which do not support them their self image and self respect. Fiona excels at working with people who want to make changes in order to be truly content and focussed on their future happiness. Her practice is built on results, recommendation and a commitment to people so they can overcome obstacles in their way and achieve the results they want. Following your initial inquiry we will arrange a complimentary phone consultation where you will have an opportunity to discuss and outline the help you need and ask any questions you may have that allows you to feel comfortable and confident that she’s the right therapist to help you. She will also explain the programme schedule, pricing and payment process. The Programme for Irrefutable Change is conducted over a 4 week period to ensure the new behaviours and thinking patterns are embedded. Session 1 is a 90 minute appointment where we cover the nature of the issue and begin the process of change. It is during the following 3 sessions where the changes we have discussed are solidified and a new way positive set of behaviours established. Advanced Hypnosis and Subconscious Mind Coaching. Author of Emotion Lotion: a simple guide to Mental Hygiene and retaining your sanity. Member of the Complementary and Natural Healthcare Council.